This lush and colorful succulent combo in a pedestal pot looks difficult, but it’s simple once you know how. With the help of the step-by-step instructions and photos that follow, you’ll soon be making your own lovely DIY floral-style succulent centerpieces, gift arrangements, and more. To create this floral-style centerpiece, the designer chose a white-painted wooden urn 12 inches in diameter and 8 inches tall, with a basin 3 inches deep. 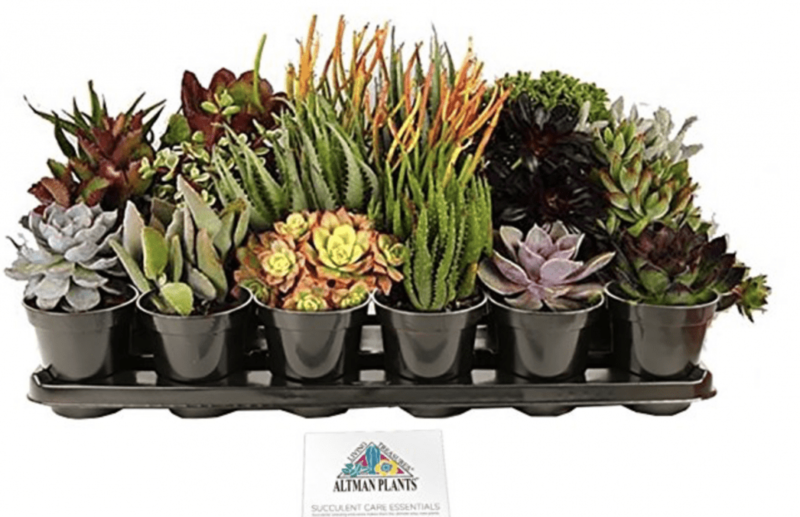 Plants include ‘Sunburst’ aeonium, Echeveria ‘Perle von Nurnberg’, burro tail sedum, assorted blue echeverias, lithops (living stones), and Senecio radicans (fish hooks). Cut a circle from heavy mil plastic (such as a trash bag) and use it to line the basin. Fill with potting mix and press down on the soil with your palms to compact it. Form a mound several inches high in the middle that slopes to just below the rim. 2. In the center, plant an upright cluster of the largest rosettes. 3. Tuck smaller plants or cuttings around the center grouping, facing outward at a slight angle. 4. When the arrangement is nearly finished but still has some gaps, use a chopstick to push roots of remaining plants into the soil, and to tuck and conceal the edge of the plastic below the rim. Gently brush spilled soil off the leaves, then water the completed arrangement lightly to settle the roots. Because there’s no drainage, water it minimally, about once a week, to moisten the soil, but not so much that the roots are sitting in a puddle of water. 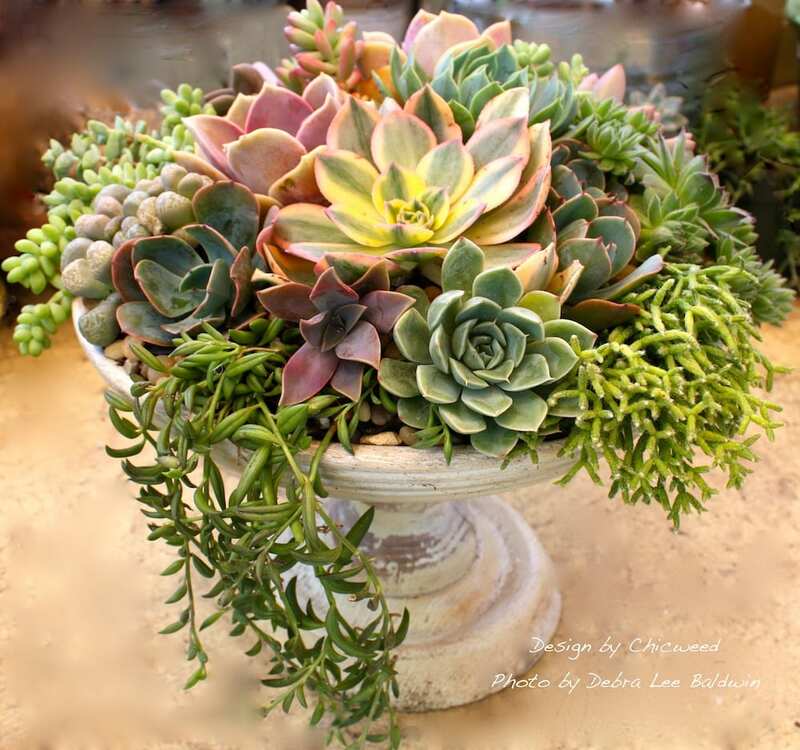 Also find DIY floral-style succulent centerpieces in my books, Succulent Container Gardens and Succulents Simplified, and learn how to make them in my online Craftsy class, Stunning Succulent Arrangements. Also visit my YouTube channel for more great ideas for using and designing with succulents!